Even when the weather is cooler it’s important to take time to inspect the exterior of your house. While walking around outside, this Johnston homeowner found a raccoon making itself comfortable under the deck! This is the perfect place for these critters to set up a dark and protected space for a den. Our pest control technicians were able to safely trap this raccoon and release it to a wildlife preserve where it can establish a new home in its natural habitat. Raccoons are a common issue for homeowners in the spring and the fall seasons when they’re looking for shelter or scavenging for food. It’s important to be aware of activity in your yard so you can take care of any issues before pests get inside and become a major problem. Our wildlife control professionals will give you tips to ward off raccoons and keep them from invading your house. Besides the obvious signs of animal activity in your yard, like tracks and droppings, raccoons will also make their presence known by leaving scratch marks on trees or holes in the lawn. Homeowners will typically have the most trouble with raccoons tearing up the yard in the springtime when they’re searching underground for worms and insects. Raccoons are also commonly found making a den in sheltered areas of the yard. Sometimes they can be discovered in a pile of logs, which is why it’s important to properly store or cover firewood outside your home. 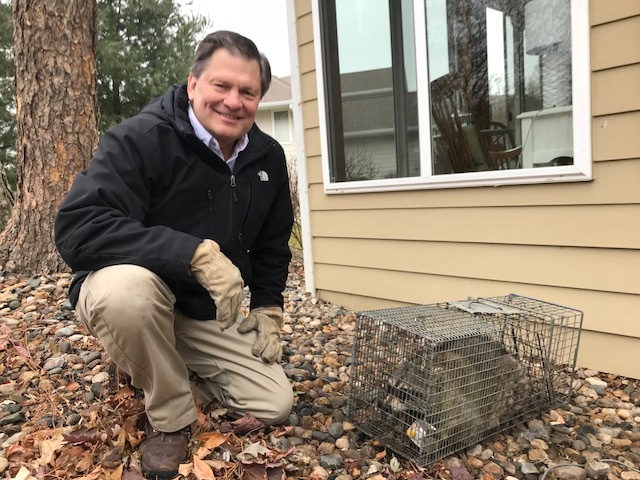 The most common place to find raccoons is under porches and decks - just like the critter captured in Johnston by Brad, Preferred Pest Control’s owner. The easiest way to get rid of raccoons and other scavengers is to take away their food source. There are plenty of opportunities for scavenging in most yards, so we’ll share what foods they’re looking for and the best ways to cut off their supply. Garbage. These critters are not picky about what they eat and are commonly known as dumpster divers. It’s important to make sure that trash cans are properly sealed or even latched to keep raccoons away. Not only sealing garbage, but also cleaning or hosing down trash bins is a good preventive measure to take away the scent of food scraps. Fruit & Vegetables. Surely you’ve noticed if these pests have disturbed your garden full of home-grown veggies. They’re not doing this just for the fun of it - they’re stealing your vegetables or digging around to find the insects that live in the soil. Try putting up a small fence to keep them out of your garden. They’re also fond of fruit that has fallen from trees, so make it a habit to regularly pick up fallen fruit in your yard to prevent raccoons from roaming around. Seeds & Nuts. Homeowners commonly spot raccoons wreaking havoc on their bird feeders as they try to get to the contents inside. To take away an easy opportunity for scavengers to get free food, bring bird feeders and pet bowls inside before you settle in for the night. How Do Raccoons Get Inside? The process to invade a home isn’t easy, but raccoons can be resourceful and are equipped with sharp claws to aid their efforts. These pests will typically enter from the roof. Raccoons can easily climb trees and leap onto the roof to get access to the top of the building. If you have trees with branches close to your house, try to keep them trimmed or use preventive measures to keep animals off. Once on top of the roof, the easiest route inside the home is through the chimney or any other vents. Make sure these are covered with durable material like metal mesh. Raccoons will also work hard to rip off shingles or claw through gutters to make their way into the attic. If you think you have raccoons in the attic, contact your local pest control exterminator right away! Our pest technicians can remove raccoons and other wildlife in and around your home or business. If you’re noticing these activities in your yard or think you hear raccoon noises in your attic, let our trained professionals take care of it! Call Preferred Pest Control today at (515) 276-7277 or schedule an appointment online.